Jaz trains to build strength and endurance to finally take down Jack. But when she finds out where he is, she inadvertently runs straight into more danger than she’d bargained for. Will she be able to forge through the wildlands alone to get the revenge she craves? Carl receives an anonymous tip that changes everything and sets him on a journey across the backlands of Pennsylvania, where he discovers the darkest sides of man. Meanwhile, Ethan and Michael set out in search for Watcher One. But with time quickly running out, will they be able to survive out in the wilderness for weeks with minimal supplies long enough to locate the man who jeopardizes their very existence? And as the Confederation continues to unravel, Cassy is determined not to let Ephrata slip away. When she meets with their new leader, she stumbles onto a threat so deep and insidious it may lead to her ultimate demise. series is great, a must read for like minded folks, leaves you wanting more,, book #9 where is it? this is a good book but I fear the authors don't know how to end it. The series is awesome. Can’t wait for book 9, hopefully it won’t be long before the book comes out. Plus Kevin Pierce is one of my favorite readers. Waiting patiently. I can not get enough of the series! It is well written and keeps me engaged and gives me many ideas, especially when it comes to gardening. When is book 9 coming out? i love the series, but it seems to be startling in this book. i want left excited and eager for the next book like i have been. That said I do want to see where it will go in the next book. Absolutely phenomenal ... GREAT SERIES.. absolutely one of my favorite series EVER.. Post apocalyptic /prepper stories are some of my favorites.. If you are into this Genre you must listen to this series. Great story line with some of the best characters I have come to know...the series is ALWAYS fresh and exciting.. Unpredictable.. With twists and turns and new characters introduced throughout ... Too both love and hate. Kevin Pierce is one of the best readers ever.. He is clear, concise, and the characters are easily understood and have their own voice. You will not be disappointed. good book. much like the others. this one turned out to be a crazy wild build up for the next. 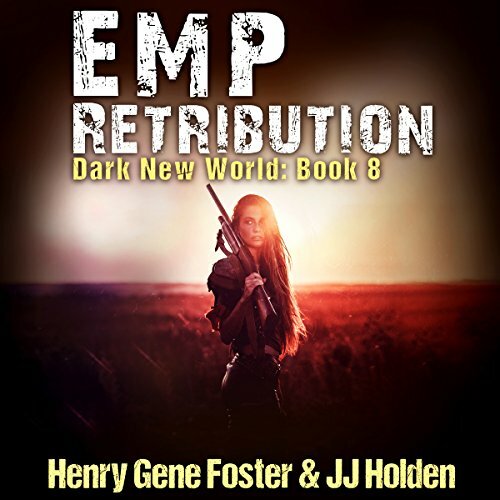 After reading Dark New world books 1 through 7, I eagerly awaited for this book 8 to hit the stores only to be very disapponted. After the author masterfully brings together several relationships in his other novels, he lets them all disseminate through a very choppy story line. Hopefully in book 9 he can bring the story back together and give me a thrilling ending. great addition to the story. well performed and well written. can't wait for the next one. Great series, it is really nice that they don't have boring books in this series they keep the story moving forward and always keep it interesting. This combined with a great reader like Kevin Pierce makes this one of my favorite series.